SOFT DOUGH AND WILL NOT FORM A BALL). PLACE EACH PORTION IN THE GREASED PAN IN A RANDOM WAY. BAKE APPROXIMATELY 30-40 MINUTES OR UNTIL TOOTHPICK INSERTED IN MIDDLE COMES OUT CLEAN. 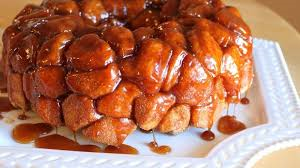 This Monkey bread with caramel flavor is so much fun, anytime. It makes for a great dessert after dinner or for any get together. FOLIC ACID)), SUGAR, CINNAMON AND NATURAL FLAVOR. A quick, delicious brunch or snack! Caramel, pecans and a streusel topping - yummy goodness all rolled into one. INGREDIENTS: SELF-RISING ENRICHED FLOUR BLEACHED ((WHEAT FLOUR, LEAVENING (SODIUM ALUMINUM PHOSPHATE, BAKING SODA, CALCIUM SULFATE, MONOCALCIUM PHOSPHATE), SALT, MALTED BARLEY FLOUR, NIACIN, IRON, THIAMIN MONONITRATE, RIBOFLAVIN, FOLIC ACID)), SUGAR, NATURAL FLAVOR, UNBLEACHED WHEAT FLOUR (WHEAT FLOUR, MALTED BARLEY FLOUR, NIACIN, IRON, THIAMIN MONONITRATE, RIBOFLAVIN, FOLIC ACID), PECANS, BROWN SUGAR AND CINNAMON. CONTAINS WHEAT AND TREE NUTS (PECAN) INGREDIENTS. YUMM!! 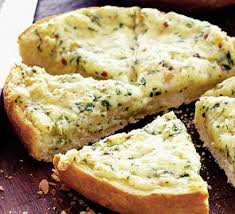 This is a delicious addition to any meal with a cheesy garlic flavor that you and your family won't be able to get enough of. INGREDIENTS: SELF-RISING ENRICHED FLOUR BLEACHED ((WHEAT FLOUR, LEAVENING (SODIUM ALUMINUM PHOSPHATE, BAKING SODA, CALCIUM SULFATE, MONOCALCIUM PHOSPHATE), SALT, MALTED BARLEY FLOUR, NIACIN, IRON, THIAMIN MONONITRATE, RIBOFLAVIN, FOLIC ACID)), SUGAR, PARMESAN/ROMANO CHEESE (CULTURED PASTEURIZED PART SKIM AND WHOLE MILK, SALT, AND ENZYMES. MICRO CRYSTALLINE CELLULOSE USED FOR ANTI-CAKING), AND GRANULATED GARLIC. 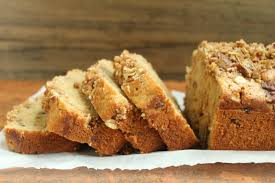 Try this quick bread that tastes exactly like apple pie!!!! Every family member is going to enjoy the sweet, apple cinnamon flavor bursting out of this sweet bread! INGREDIENTS: SELF-RISING ENRICHED FLOUR BLEACHED ((WHEAT FLOUR, LEAVENING (SODIUM ALUMINUM PHOSPHATE, BAKING SODA, CALCIUM SULFATE, MONOCALCIUM PHOSPHATE), SALT, MALTED BARLEY FLOUR, NIACIN, IRON, THIAMIN MONONITRATE, RIBOFLAVIN, FOLIC ACID)), SUGAR, DRIED APPLE NUGGETS, AND CINNAMON. 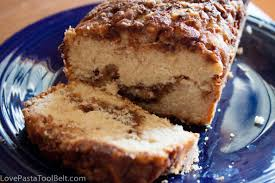 This is a fun quick bread that has a delicious cinnamon swirled through out every piece. You need to try a bite of this fantastic bread! INGREDIENTS: SELF-RISING ENRICHED FLOUR BLEACHED ((WHEAT FLOUR, LEAVENING (SODIUM ALUMINUM PHOSPHATE, BAKING SODA, CALCIUM SULFATE, MONOCALCIUM PHOSPHATE), SALT, MALTED BARLEY FLOUR, NIACIN, IRON, THIAMIN MONONITRATE, RIBOFLAVIN, FOLIC ACID)), SUGAR, AND CINNAMON. Just keep it simple with our Classic quick bread. It's simple but still an amazing bread. 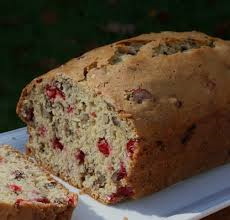 This quick bread is the perfect mix of cranberry and nuts with a delicious streusel topping. Sure to be a new family favorite!! INGREDIENTS: SELF-RISING ENRICHED FLOUR BLEACHED ((WHEAT FLOUR, LEAVENING (SODIUM ALUMINUM PHOSPHATE, BAKING SODA, CALCIUM SULFATE, MONOCALCIUM PHOSPHATE), SALT, MALTED BARLEY FLOUR, NIACIN, IRON, THIAMIN MONONITRATE, RIBOFLAVIN, FOLIC ACID)), SUGAR, DRIED CRANBERRIES, UNBLEACHED WHEAT FLOUR (WHEAT FLOUR, MALTED BARLEY FLOUR, NIACIN, IRON, THIAMIN MONONITRATE, RIBOFLAVIN, FOLIC ACID), PECAN PIECES, NATURAL FLAVORING, BROWN SUGAR AND CINNAMON. CONTAINS WHEAT AND TREE NUTS (PECANS) INGREDIENTS. Our customers can't get enough of this bread. 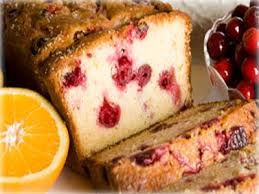 It has a delicious mixture of cranberry and orange flavor that will have the whole family asking for seconds. INGREDIENTS: SELF-RISING ENRICHED FLOUR BLEACHED ((WHEAT FLOUR, LEAVENING (SODIUM ALUMINUM PHOSPHATE, BAKING SODA, CALCIUM SULFATE, MONOCALCIUM PHOSPHATE), SALT, MALTED BARLEY FLOUR, NIACIN, IRON, THIAMIN MONONITRATE, RIBOFLAVIN, FOLIC ACID)), SUGAR, DRIED CRANBERRIES AND NATURAL FLAVORINGS. 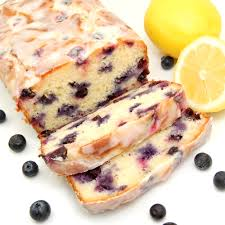 This delicious bread has the full flavors of fresh blueberries and lemon throughout every bite. It's sweet and even makes for a great snack. INGREDIENTS: SELF-RISING ENRICHED FLOUR BLEACHED ((WHEAT FLOUR, LEAVENING (SODIUM ALUMINUM PHOSPHATE, BAKING SODA, CALCIUM SULFATE, MONOCALCIUM PHOSPHATE), SALT, MALTED BARLEY FLOUR, NIACIN, IRON, THIAMIN MONONITRATE, RIBOFLAVIN, FOLIC ACID)), SUGAR, NATURAL FLAVORINGS, AND BLUEBERRY FLAVORED APPLE NUGGETS (APPLES, NATURAL FLAVORS, CITRIC ACID, ARTIFICIAL COLORS (RED #40 & BLUE #1), SODIUM CITRATE). 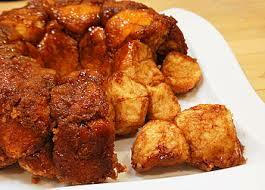 This cinnamon Monkey bread is so much fun, anytime. It makes for a great dessert after dinner or for any get together. Even the kids will give up their ice cream for this amazing bread. A perfect bread for the holidays or ANYTIME!! This bread is so delicious! 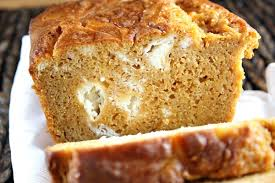 It is bursting with pumpkin flavor that is complimented by the cream cheese. 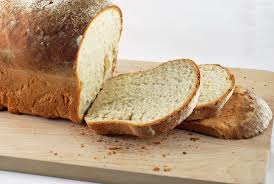 YUMMMY, this bread is great! INGREDIENTS: SELF-RISING ENRICHED FLOUR BLEACHED ((WHEAT FLOUR, LEAVENING (SODIUM ALUMINUM PHOSPHATE, BAKING SODA, CALCIUM SULFATE, MONOCALCIUM PHOSPHATE), SALT, MALTED BARLEY FLOUR, NIACIN, IRON, THIAMIN MONONITRATE, RIBOFLAVIN, FOLIC ACID)), SUGAR, UNBLEACHED WHEAT FLOUR (WHEAT FLOUR, MALTED BARLEY FLOUR, NIACIN, IRON, THIAMIN MONONITRATE, RIBOFLAVIN, FOLIC ACID), CREAM CHEESE SEASONING ((CREAM CHEESE POWDER (CREAM CHEESE [PASTEURIZED MILK, CHEESE CULTURE, SALT, CAROB BEAN GUM], NONFAT MILK, CULTURED CREAM, SODIUM CASEINATE, LACTIC ACID, CITRIC ACID, DISODIUM PHOSPHATE, NATURAL FLAVORS, BHA), SUGAR, FRUCTOSE, MODIFIED FOOD STARCH, CITRIC ACID, NATURAL FLAVOR, GUAR GUM, AND LACTIC ACID, LESS THAN 2% SILICON DIOXIDE ADDED TO PREVENT CAKING)), BROWN SUGAR, CINNAMON, CLOVES, AND GINGER. 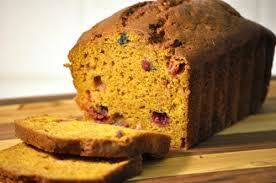 A perfect pumpkin and cranberry flavored bread mix with a streusel topping. It's delicious and easy, a must have for any occasion!! INGREDIENTS: SELF-RISING ENRICHED FLOUR BLEACHED ((WHEAT FLOUR, LEAVENING (SODIUM ALUMINUM PHOSPHATE, BAKING SODA, CALCIUM SULFATE, MONOCALCIUM PHOSPHATE), SALT, MALTED BARLEY FLOUR, NIACIN, IRON, THIAMIN MONONITRATE, RIBOFLAVIN, FOLIC ACID)), SUGAR, DRIED CRANBERRIES, BROWN SUGAR, CINNAMON AND NUTMEG. 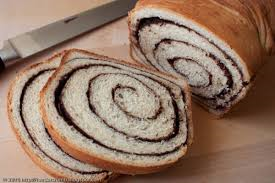 With fresh raspberry flavors and cream cheese swirled throughout this delicious bread you will not be able to put it down!! INGREDIENTS: SELF-RISING ENRICHED FLOUR BLEACHED ((WHEAT FLOUR, LEAVENING (SODIUM ALUMINUM PHOSPHATE, BAKING SODA, CALCIUM SULFATE, MONOCALCIUM PHOSPHATE), SALT, MALTED BARLEY FLOUR, NIACIN, IRON, THIAMIN MONONITRATE, RIBOFLAVIN, FOLIC ACID)), SUGAR, CREAM CHEESE SEASONING ((CREAM CHEESE POWDER (CREAM CHEESE [PASTEURIZED MILK, CHEESE CULTURE, SALT, CAROB BEAN GUM], NONFAT MILK, CULTURED CREAM, SODIUM CASEINATE, LACTIC ACID, CITRIC ACID, DISODIUM PHOSPHATE, NATURAL FLAVORS, BHA), SUGAR, FRUCTOSE, MODIFIED FOOD STARCH, CITRIC ACID, NATURAL FLAVOR, GUAR GUM, AND LACTIC ACID, LESS THAN 2% SILICON DIOXIDE ADDED TO PREVENT CAKING)), RASPBERRY FLAVORED APPLE NUGGETS (APPLES, CITRIC ACID, MALIC ACID, NATURAL FLAVORS, ARTIFICIAL COLORS [RED #40 & BLUE #1]) AND NATURAL & ARTIFICIAL FLAVORING. 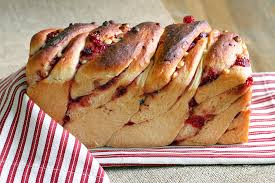 A delicious bread for any time, full of white chocolate and cranberry flavor. INGREDIENTS: SELF-RISING ENRICHED FLOUR BLEACHED ((WHEAT FLOUR, LEAVENING (SODIUM ALUMINUM PHOSPHATE, BAKING SODA, CALCIUM SULFATE, MONOCALCIUM PHOSPHATE), SALT, MALTED BARLEY FLOUR, NIACIN, IRON, THIAMIN MONONITRATE, RIBOFLAVIN, FOLIC ACID)), SUGAR, WHITE CONFECTIONERY BAKING CHIPS (SUGAR, PALM KERNEL OIL, NONFAT MILK POWDER, WHOLE MILK POWDER, WHEY POWDER, PALM OIL, SOY LECITHIN (AN EMULSIFIER) AND VANILLA), DRIED CRANBERRIES AND NATURAL FLAVORINGS.